The Tamil Nadu Electricity Regulatory commission (TNERC) has pulled up the State Load Despatch Centre (SLDC) for curtailment of solar power generation. The recent order, issued in response to a 2017 petition of the National Solar Energy Federation of India (NSEFI), emphasised that "the SLDC cannot curtail the renewable power at their convenience". Curtailment of power means that the SLDC asks power plants not to inject power into the grid despite availability. In India, wind and solar plants have been assigned a ‘must-run status’ and SLDC can issue ‘back-down orders’ to these plants only if grid security is a concern. In reality however, curtailment is often driven by ‘illegal’ commercial concerns wherein renewable generation is backed down in favour of cheaper conventional power under the influence of state distribution companies (discoms). This severely impacts the bottom line of renewable developers as there is no compensation mechanism available for recovery of even the plant’s fixed charges. So far, curtailment data has never been available in the public domain due to a lack of transparency on the part of SLDCs and discoms. Industry observers had estimated this to be in the range of 1-5 per cent for solar power. However, the data from NSEFI for 10 solar plants included in the TNERC order shows that during the first half of 2017, plants faced up to 100 per cent of generation curtailment on several days during a given month. The data proves that these curtailments were not due to technical reasons because during the considered time period, the grid frequency crossed the limit of 50.10 Hertz (Hz) only 1 per cent of the time. Further, there is clear evidence of commercial motives as solar plants with a higher tariff of Rs 7 per unit, were curtailed more than newer plants with a lower tariff of Rs 5 per unit. In its response, SLDC was not able to provide clear evidence of these being technical requirements for grid security, beyond making general statements. 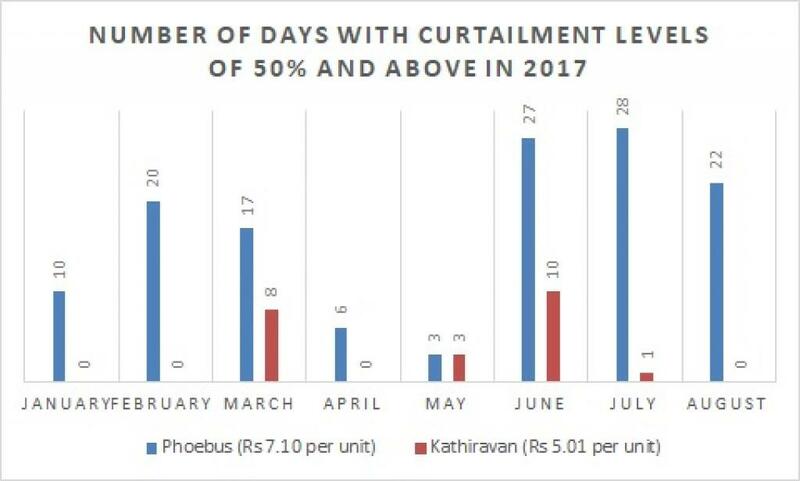 Curtailment, while prevalent in all renewable-rich states, is most pronounced in Tamil Nadu, which has the highest renewable penetration in India at 11,758 MW installed capacity. It is crucial that the state, along with others, take concrete steps against curtailment in view of the ambitious renewable capacity addition planned ahead. Various mechanisms to check curtailment such as introduction of ­ forecasting and scheduling, thermal flexing, penalties on discoms, and compensation to developers through multi-part tariff structure, among others currently remain at draft/discussion stage. As for Tamil Nadu, to discourage future curtailment, TNERC, in the recent order, has asked the SLDC to submit a quarterly report of curtailed renewable generation with clearly documented reasons for each back down order. It further states that ‘any whimsical backing down instruction would attract penal action under Section 142 of the Electricity Act on concerned officials’. While the order is significant as in there is formal acknowledgement of existence of commercial ‘illegal’ curtailment, it may not amount to anything more than a slap on the wrist if TNERC fails to keep track and impose required penalties. Also, implementation of forecasting and scheduling needs to be expedited on priority, which continues to remain at the draft regulation stage in Tamil Nadu for over a year.